Are you costing yourself thousands of dollars by being a For Sale By Owner? You decided you want to sell your house by yourself. Maybe you’re like most For Sale By Owners (FSBO) who has been trying to sell your home for months, endlessly showing your home and not getting any offers. This can be very frustrating! You may think you are saving yourself thousands of dollars for the listing agents’ commission, but they are experts in their field and can actually net you more money from the sale of your home! Here’s 8 ways you are costing yourself thousands of dollars. You need to know how to accurately price your home. Real Estate Salespersons are trained on how to accurately price homes. The National Association of Realtors statistics show Realtor® assisted home sales get 20% more money than FSBO homes, on average. Homes are not priced by how much you paid for it, or how much you wish to net from the sale. 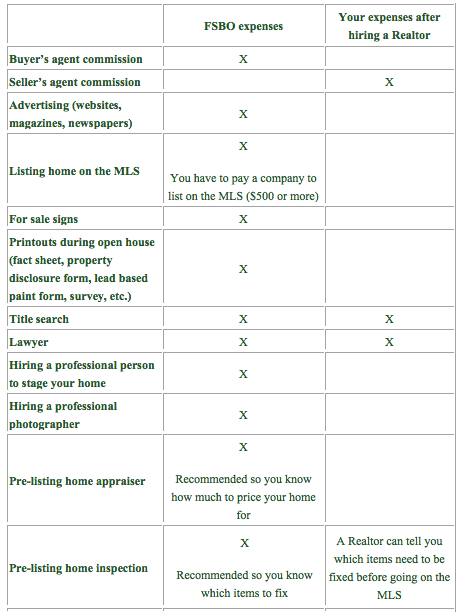 Can you provide a buyers’ agent a Comparable Market Analysis that determines a fair market value for your home? Most buyers don’t want to pay more for a home that is very similar to other homes for sale in the neighborhood. The biggest risk of overpricing your home is you help sell your competition’s home! On the other hand, if you unknowingly underprice your home you are costing yourself thousands of dollars. Recent studies done by the National Association of Realtors have shown that 93% of buyers search online for a home. That is in comparison to only 28% looking at print newspaper ads. Most real estate agents have an extensive marketing campaign to promote the sale of a home and spend hundreds of dollars of their money marketing a home. They will take professional photographs and create beautiful advertising pieces to highlight your home. A Realtor® will list your home on the local multiple listing service (MLS) because 95% of homes are sold on the MLS, making it the most effective way to advertise your home. If you are a FSBO and want your home on the MLS, you will need to pay a real estate company hundreds of dollars to list your home on the MLS, and all of the marketing costs come out of your pocket, which dips into your profits. Also, your listing agent will offer approximately half of the commission to buyers agents so they bring their buyer clients to view your home. If you sell your home by yourself you would negotiate a commission with the buyers’ agent and pay them yourself. The more people that see your home, the higher chance you will have at selling your home! The National Association of Realtors statistics show 12% of FSBO’s indicated they don’t understand how to properly present their home. You only get one chance to make a great first impression on a buyer! Staging a home can include needed repairs, deep cleaning the home to get rid of pet and smoke odors, de-cluttering, and possibly changing the décor so the majority of buyers can envision themselves living in the home. Staged homes show better, sell faster and buyers perceive their value to be greater if the home appears to be in move-in condition! When you list your home with a Realtor®, your agent will not allow you to be at any showings because you may inadvertently reveal something that weakens your negotiating position. If you don’t know how much your house is actually worth, it would be difficult to recognize when a buyer presents a market value offer, especially an under market value! Realtors® are great at negotiating a good price for their buyer clients. How are your negotiating skills? Being a bad negotiator or lacking the knowledge of how much your home should sell for can cost you thousands of dollars if you do not have a professional agent representing your best interest! In the last 20+ years the percentage of homeowners selling their home FSBO declined from 29% to 9%, as of 2013. The paperwork involved in selling and buying a home has increased dramatically as industry disclosures and regulations have become mandatory. Your Realtor® will ensure all paperwork has been completed and is submitted on time. In New York State, there are penalties and fines for not having the proper paperwork filled out or given to the buyer before an offer is submitted by them. For example, if you don’t fill out the Property Condition Disclosure form you need to give the buyer a $500 credit at closing. Another example is, if you do not provide a Lead Based Paint Disclosure form to the buyer before the buyer submits an offer and the buyer gets sick you could be held liable for penalties of $11,000 per violation and up to 3x the actual damages to any person injured as a result of the violation. If your home is priced accurately, you should see the most activity within the first 1-2 weeks of advertising your home for sale. According to Realtor.com, if a Realtor® listed the home for sale it would sell within 5 weeks. Realtors® vet potential buyers so only serious buyers view your home. As a FSBO, do you request financial data or a pre-approval letter before letting strangers into your home to determine their credit worthiness? The longer your home goes unsold, the more money you spend paying for your current mortgage and marketing efforts. As a FSBO, you will be doing all of the work yourself and the entire process takes months to complete. Without an agent your weeknights and weekends could be spent endlessly cleaning and showing your home to unqualified buyers. On the other hand, your Realtor® takes all of the guesswork out of presenting your home in the best light, they will pre-screen buyers and show your home for you. Do you want to spend months doing everything yourself to save the listing agents’ commission or would you rather pay the commission and have an expert guide you through one of the biggest financial decisions of your life? https://blakerealtygroup.com/wp-content/uploads/2018/08/blake-logo-white.png 0 0 innovationsahead.com https://blakerealtygroup.com/wp-content/uploads/2018/08/blake-logo-white.png innovationsahead.com2015-12-10 16:47:122018-09-04 13:01:10Are you costing yourself thousands of dollars by being a For Sale By Owner? Properties found on this Web site may be listed with a brokerage other than the owner of this site and are displayed here via the Internet Data Exchange (IDX) system of this broker's MLS. All information deemed reliable but not guaranteed and should be independently verified. All properties are subject to prior sale, change or withdrawal. Neither listing nor displaying broker shall be responsible for any typographical errors, misinformation, misprints, and shall be held totally harmless. © 2018 Western New York Real Estate Information Services (WNYREIS), LLC. All rights reserved. information being provided is for consumers’ personal, non-commercial use and may not be used for any purpose other than to identify prospective properties that consumers may be interested in purchasing.